Vintage styling is hot, and many modern watch collections include models that look to the past for inspiration. 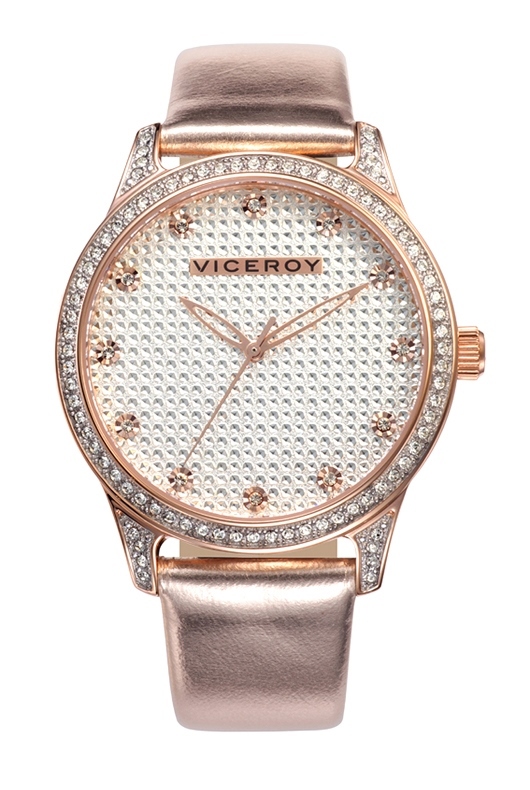 The Viceroy Communion women’s model pictured here is such a watch, with a case shape that echoes a popular look from the sixties and seventies: some call this shape tonneau, meaning barrel in French – indeed it is barrel-shaped – but others will notice its resemblance to the cushion-cased dive watches of the era. However the shape is described, what’s for certain is that Viceroy’s sporty DNA is apparent all throughout this straightforward three-handed model. This watch in particular is the epitome of versatility: stainless steel case with black, white and silver details. The case is 35 mm in diameter, which is neither large nor small, meaning it does not fall into the trendy “oversized” category, but it is by no means dainty – it has wrist presence without exaggeration. The stationary bezel is also made of stainless steel. It features large painted black numbers in 10-minute increments and a decorative screw-head design between the numbers that functions as a visual balance. The crown features wide fluting and stands out as the most delicate element of this otherwise sporty design. On the dial, silver-colored numerals appear at the quarters (12, 3, 6 and 9), with trapezoid shaped hour markers in between. Below each hour marker are seconds indications in five-minute increments. The date window at 3 o’clock is edged inward to make room for the numeral 3 and framed in black for definition. 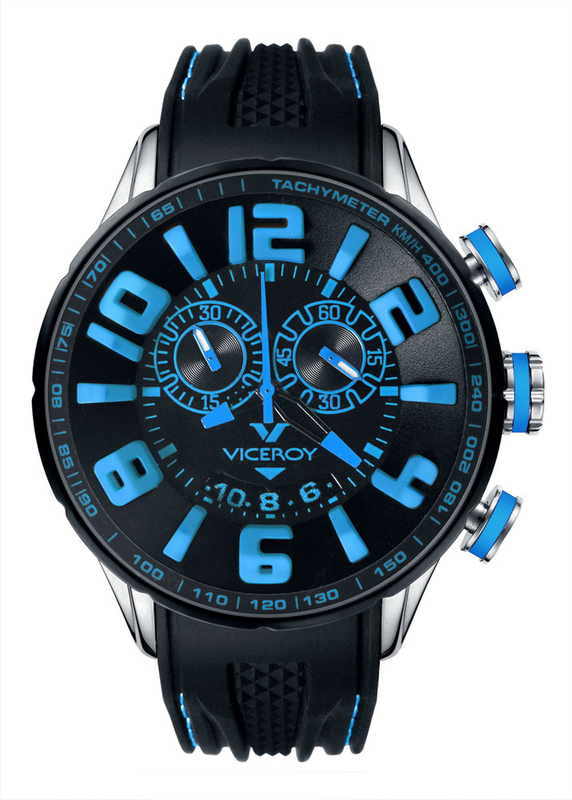 In fact, all of the printed lettering on the dial is black, including the Viceroy logo and the water resistance rating printed at 6 o’clock. 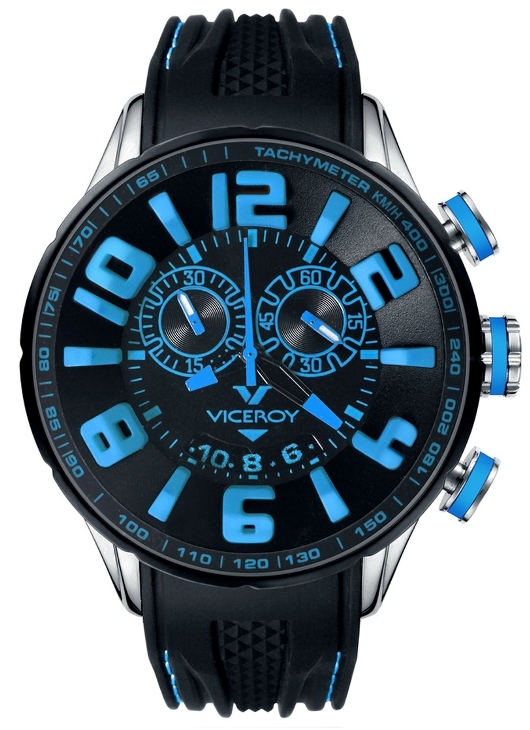 As it suggests, the Viceroy Communion is water resistant to a depth of 330 feet. In addition to the 10-minute increments on the bezel and the five-minute increments on the dial, the watch has a seconds track at the outside of the dial. As a whole, these elements provide several points of reference for the eye and improve at-a-glance readability. The stainless steel hands feature a large area of luminous material to ensure that readability is good in the dark, too. Given the stainless steel base and black-on-white design, the black leather calfskin strap is very fitting. It features a semi-oval stitch pattern at the lugs and closes by way of a tang buckle. As a daily sport watch, the Viceroy Communion is one capable companion. Wear it as part of your regular rotation or wear it exclusively; this sporty number is at the ready. 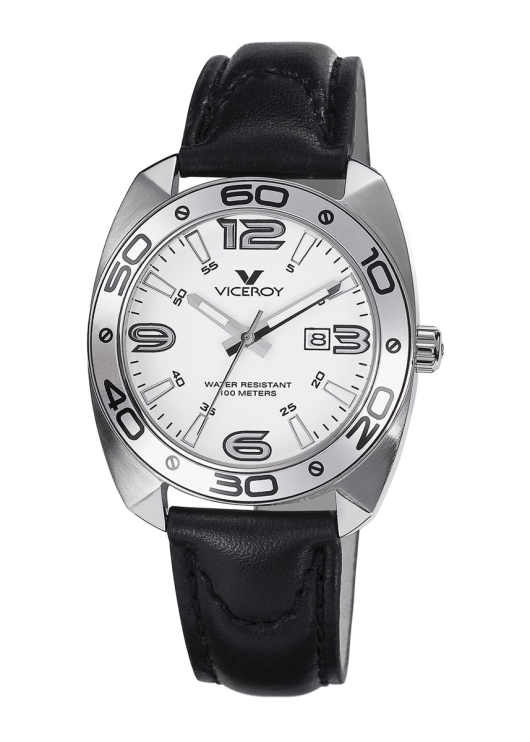 Contact your authorized Viceroy watch dealer today. The Femme collection by Viceroy is a series of modern looking watches that emphasize femininity in fashion with gold colors, glamorous details and casual sportiness. Among them is a rose-gold colored, crystal-laden timekeeper, reference number: 40700-97. This watch is no blushing beauty: it is unapologetic in its purpose as an eye-catching accessory, strong on personality and certain in character. 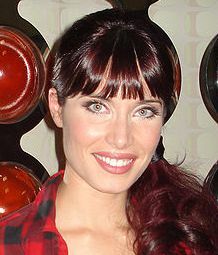 It is a timepiece created to enhance a casual-chic ensemble and to reflect the style-conscious enthusiasm of its wearer. The 41 mm stainless steel case is ion-plated in rose gold with deeply hued pink coloring. Dozens of crystals adorn the case, embedded around the bezel as well as on the upper side of the lugs. Twelve more crystals are positioned on the dial as hour markers, each set within a rose-gold-colored corolla (petals) that has the appearance of a flower. 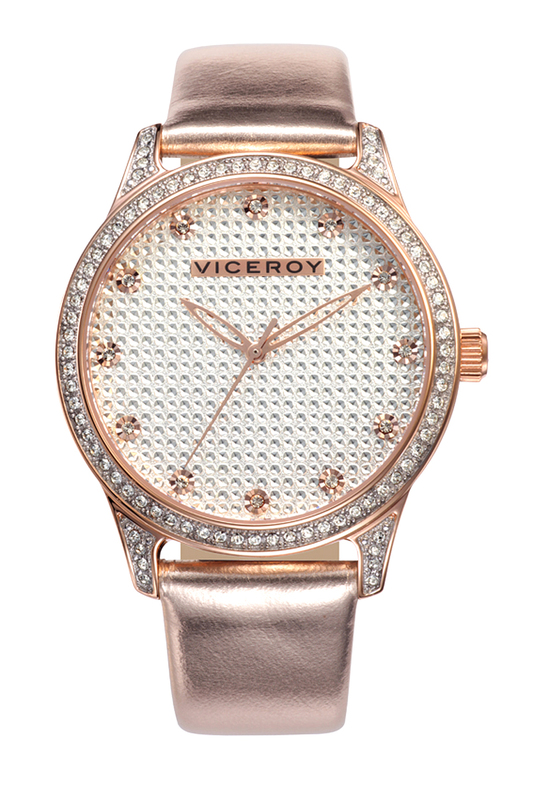 But sparkling crystal isn’t the only detail of the Viceroy Ladies 40700-97 Femme that immediately captures attention. The dial base is silver and beautified with decorative hollows that, in addition to adding texture, create another surface to reflect light – if the crystals don’t get you then the hollows sure will. The three hands of the watch are also ion-plated rose gold; the hour and minute hands are leaf-shaped and skeletonized as to not divert attention away from the dial below. The brand name Viceroy is printed in black on a solid banner for maximum exposure. Last, but not least, the watch is paired with a pink patent-leather strap, which has the characteristic gloss and shiny finish. The pink is a delightful complement to rose gold and the collective effect of this color pairing, along with the copious crystals, is über-feminine, dynamic and vibrant. The strap’s prong buckle is ion-plated in rose gold for a seamless appearance. The buckle is personalized with the name Viceroy, as is the solid steel caseback, which also conveys a few details about the watch including its water resistance (99 feet) and the type of movement it contains, i.e. quartz. 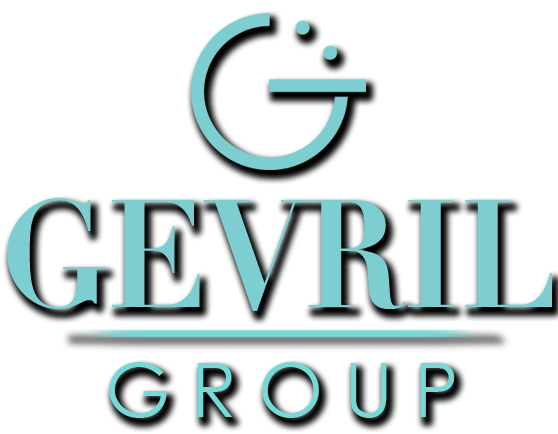 An additional “V” moniker appears on the fluted crown. Some watches were meant to flaunt, and this pink dazzler is one of them. Its large diameter has wrist presence that is amplified by the copious crystals and elegant rose-gold coloring – all dressed up for an energetic, modern woman who is ready to wear it out and wear it well. Purchase your new Viceroy watch from an authorized Viceroy dealer.